The building named Palazzo Barbaia is one of those that you don’t notice on via Toledo (aka via Roma). The building, with its straightforward neo-classical architecture doesn’t stand out compared to others around it. It is across from the small square known officially as Piazzetta Duca d’Aosta and popularly as Piazzetta Augusteo, site of the main cable-car (opened in 1885; archts: Adolfo Avena, Stanislavo Sorrentino) and the adjacent Augusteo Theater (built in 1926-9; archts: Arnaldo Foschini, Pier Luigi Nervi). That theater, itself, replaced a smaller theater built by Luigi Vanvitelli within the Palazzo Tomacelli, demolished to make room for newer construction. The small square handles the flow of people from both the cable-car and theater. The Palazzo Barbaia is also adjacent to the via Roma entrance of the gigantic Galleria Umberto. All of that is what you notice in the area; about the only thing that stands out on the Palazzo Barbaia is the sign in front that tells you that Rossini lived here, and thereby hangs one of those stories that you hope is true. Domenico Barbaia (also spelled “Barbaja”) (1778-1841) (also see this link), himself, was noted as the “prince of impresarios” and even as the “viceroy of Naples.” He ran the music business in the city and was liked first by the French (rulers of Naples, under Murat, for the first decade of the 1800s), who had invited him to Naples in the first place, and also by King Ferdinand of Bourbon, who returned after Murat and the French had left. Barbaja was born in Milan and started out as a waiter in a coffee shop. They say he invented the cappuccino and was so successful that he soon owned a string of his own establishments. He also had the franchise to run the gambling casino on the premises of La Scala opera house. The Napoleonic wars (next to the cappuccino, the other great event of that age) came along, and Barbaia cleaned up selling munitions. In 1809 the French rulers of Naples offered him the job of running the San Carlo theater, which he did until 1824. In 1826, he took over the management of La Scala in Milan for a while and then returned to Naples and the San Carlo until his death. Anyway, the story that you want to be true is that Barbaia hosted Rossini in his home on via Toledo (image, above) when the young composer first moved to Naples, and that Barbaia locked Rossini in the house until Rossini finished an opera he had promised to compose. For a great composer, Rossini was notoriously attached to secondary things such as women, wine, food, travel, fishing and whatever else might give him an excuse to take a few days or months off. Alexander Dumas (father) in his 1841 book travelogue, il Corricolo, tells the story, no doubt with some embellishment, but Rossini also repeats the story1, so it seems to have taken place in some form or another. 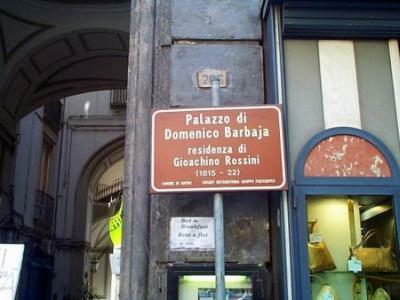 The essentials are these: Rossini arrives in Naples in late 1815 and moves into Barbaia’s home. The composer promises to write his first opera for San Carlo “soon.” After five months (!) of waiting, Barbaia shows up to see how the music writing is going. It isn’t, says Rossini. He hasn’t started, and he can’t start today because he is going fishing out in Baia. Barbaia disappears. Rossini goes to the door a bit later and finds himself locked in from the outside! His screaming does little good since even modern amplified music doesn’t do too well against thick Neapolitan walls from the 1700s. Barbaia comes back—“You called?” says the impresario. Rossini demands to be let out. Not until I get an opera, says Barbaia. Apparently, it worked; a few days later, the overture to Otello is finished and shortly thereafter the whole opera is done. 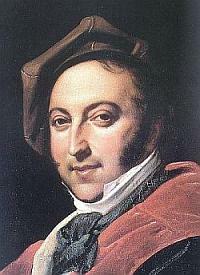 (Rossini was known as a fast composer. He wrote The Barber of Seville in three weeks.) Somewhat anticlimactically, the opera had to be premiered at the “other” official theater, il Teatro del Fondo (still standing and today called the Mercadante Theater) since San Carlo had just burned down. Rossini had his revenge. Barbaia may have taken over San Carlo, but Rossini took over Spanish soprano Isabella Colbran, Barbaia’s mistress, and married her in 1822. 1. in Gioachino Rossini, Lettere e documenti, three volumes ed. by Bruno Cagli and Sergio Ragni: vol. I Urbino 1992, vol. II Urbino 1996, vol. III Urbino 2000.